Construction on this state-of-the-art office space in Innovation Square was just completed. 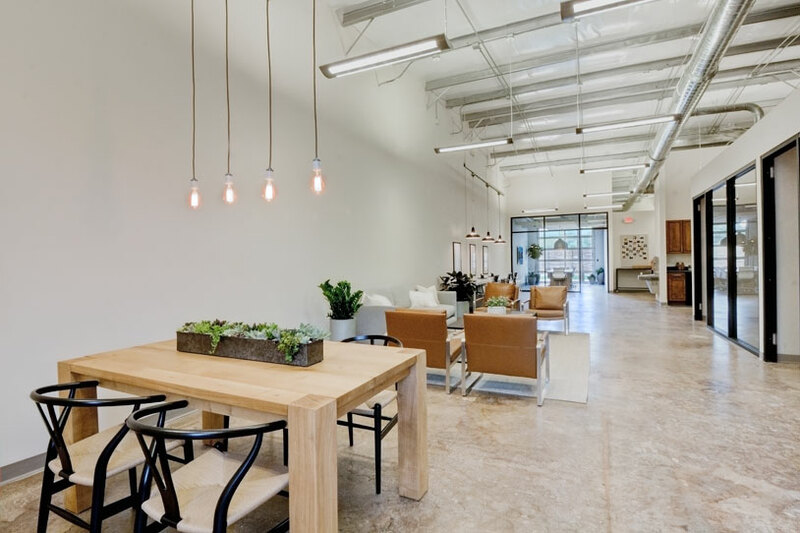 Located between downtown Gainesville and the University of Florida, this office space has unbeatable amenities. Your new office has 2 entrance points, dual parking lots, and exterior features like a water-conserving rain garden and a paved outdoor deck. This brand new Gainesvile commercial real estate can be completely customized to your needs. Your clients won't even mind waiting in an area like this! Impress them with your beautiful interior design. Not your style? Let us come up with something you’ll love. 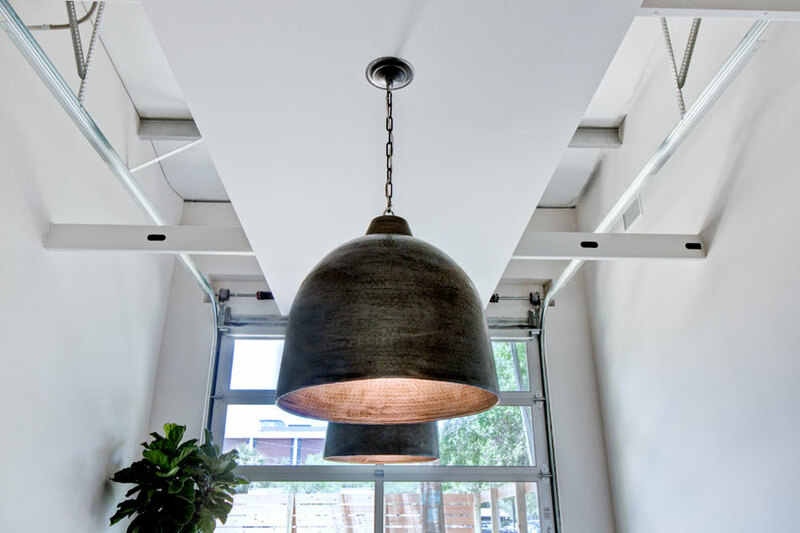 Everything in our offices can be customized to your needs from wall placement to lighting fixtures. 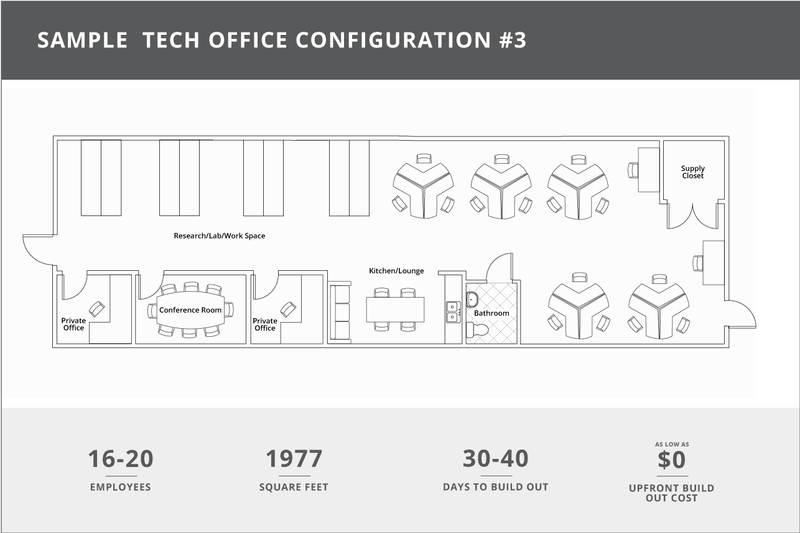 Let us help you maximize your space without trapping your employees in cramped cubicles. 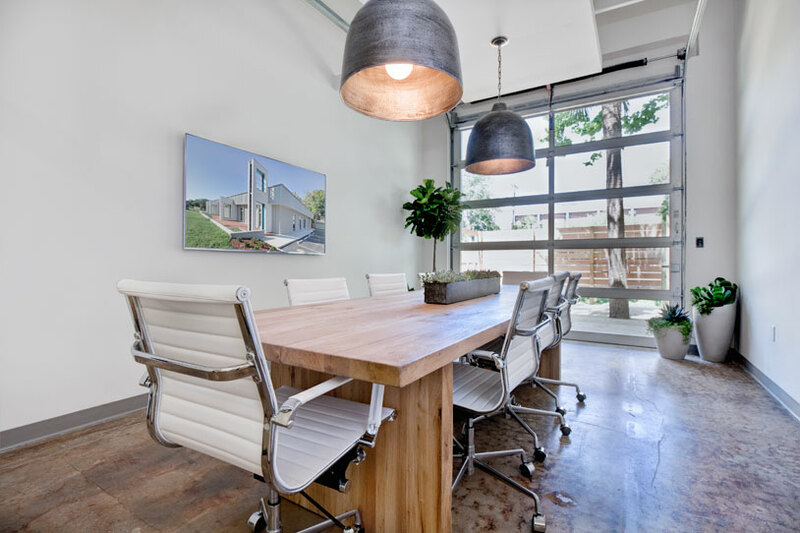 We can design and develop private, executive, and multi-employee offices. Customizable features, like a glass wall, open up the entire area and foster a collaborative environment. 104 at Innovation Square offers modern and sleek exteriors with beautiful and unique landscaping. Enjoy an eco-friendly rain garden, waterfall aqueducts, built-in benches, and a paved outdoor deck. 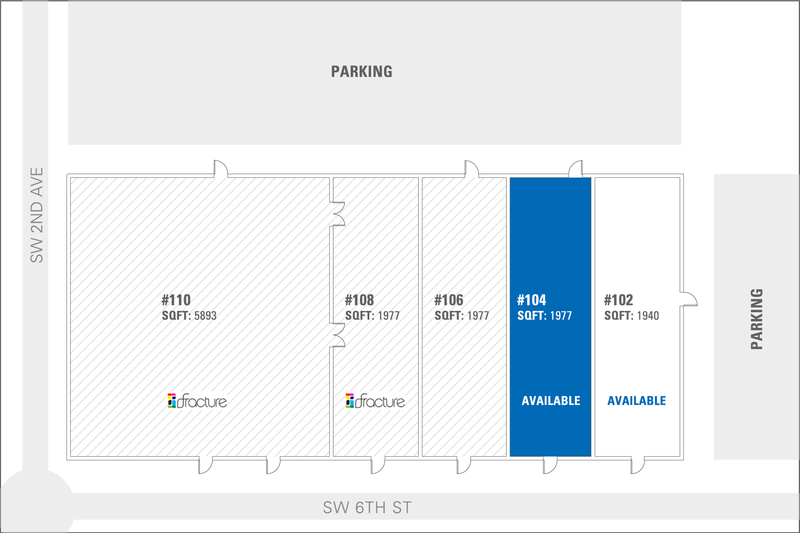 This space also offers two attached parking lots - never miss a meeting looking for parking again. Seize the opportunity to make this space work for you and your team. 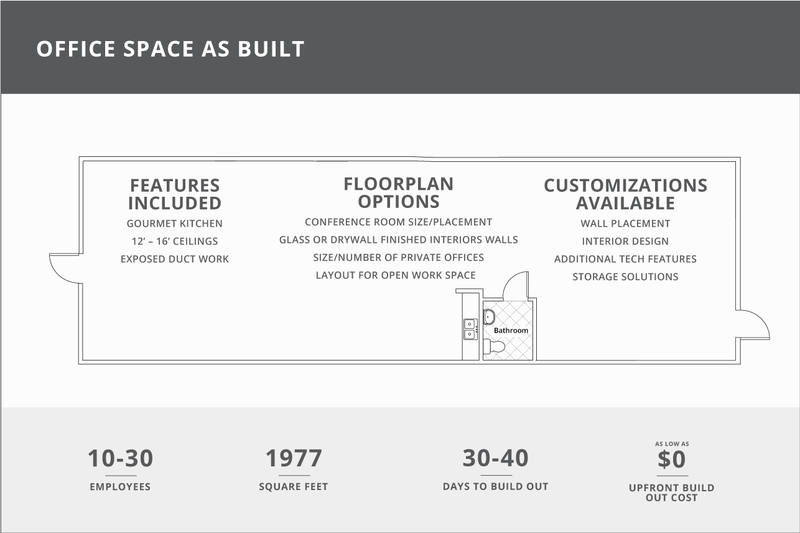 We can create a floorplan with open work spaces, or choose traditional offices for your business. Thanks to our award-winning construction team, your build-out can be completed quickly and efficiently in 30-60 days. 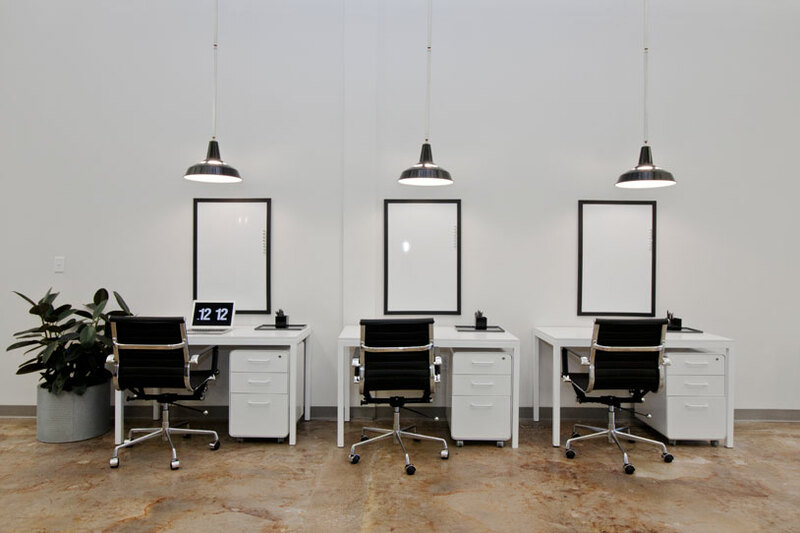 This office space is a blank canvas for you to customize. If you want your office to be colorful, our state-of-the art team will work with you to choose colors to fit the space, otherwise the space can be left white. 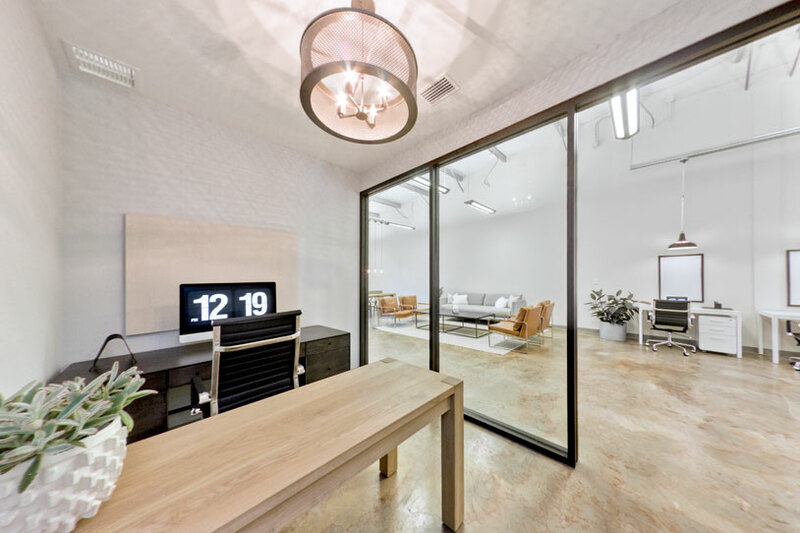 Bring it to life: choose wall colors and materials like glass or drywall to fit your office’s aesthetics. Have an office that makes your employees excited to come to work. 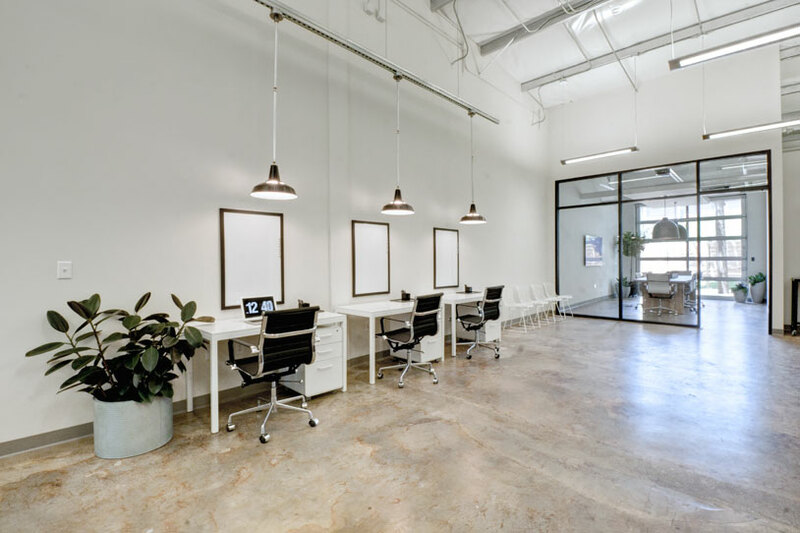 Let your company culture stand out in a custom-designed office space made specifically for your business. Choose wall colors and materials that help your employees flourish. 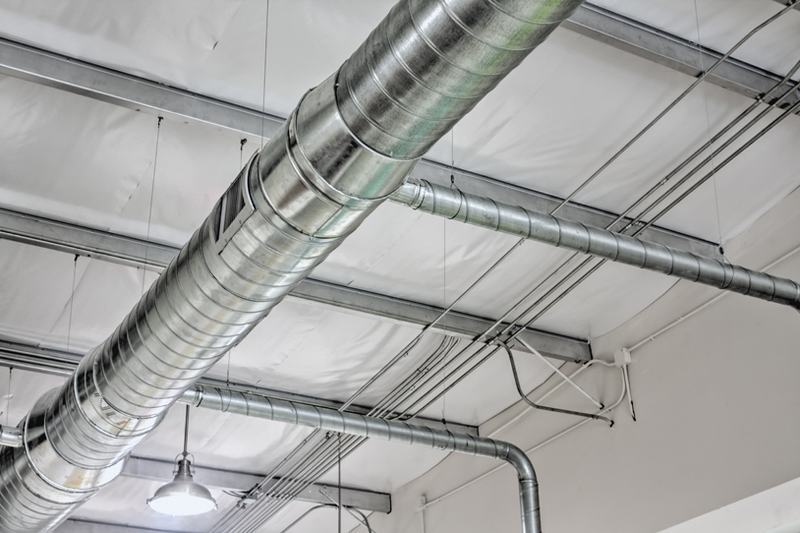 High ceilings and exposed ductwork make your office feel bigger and more spacious. 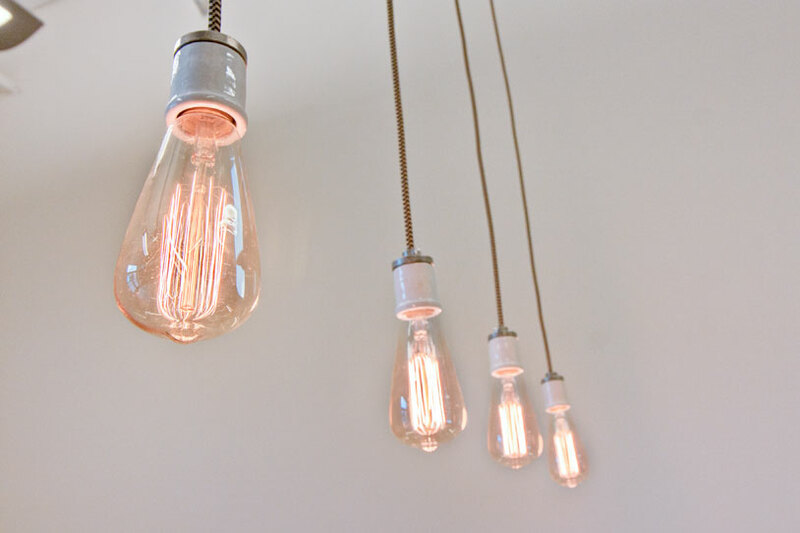 Give your employees the room they need to let their ideas circulate and grow. They'll never feel like they're in a cramped cubicle, stifling their creativity. This office space for rent is ideal for any start up or growing business. 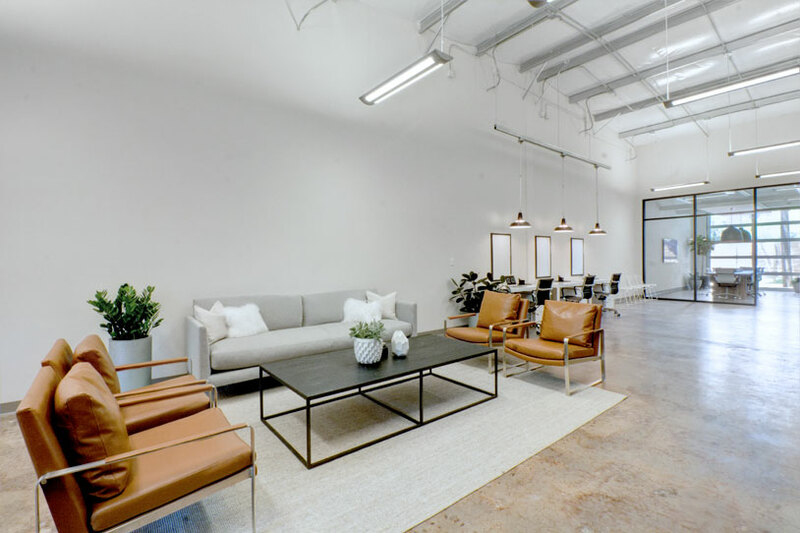 Don’t settle for boring a boring office - the high ceilings, exposed ductwork, and polished concrete floors bring a modern twist to your work space. Let our award-winning design team help make your business as productive as possible. 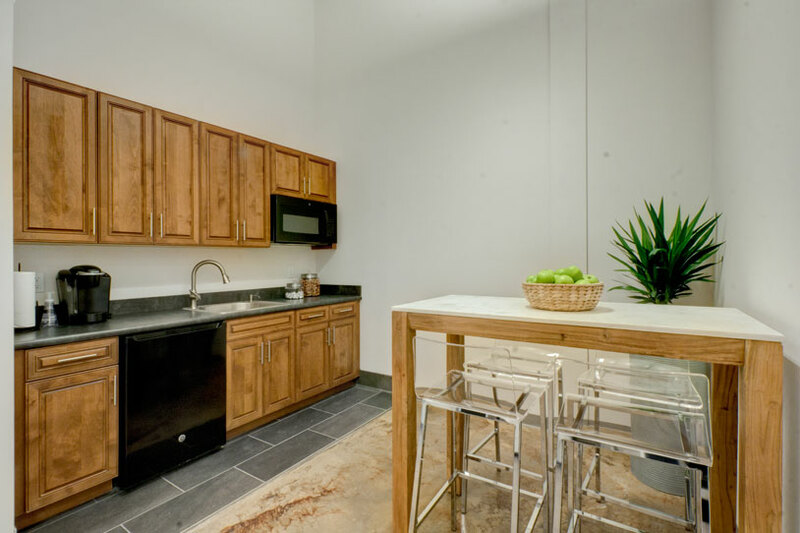 The 104 building at Innovation Square features an upscale bathroom and luxury kitchen. Make the space your own by turning the kitchen area into an employee lounge, perfect for lunch breaks and brainstorming sessions. 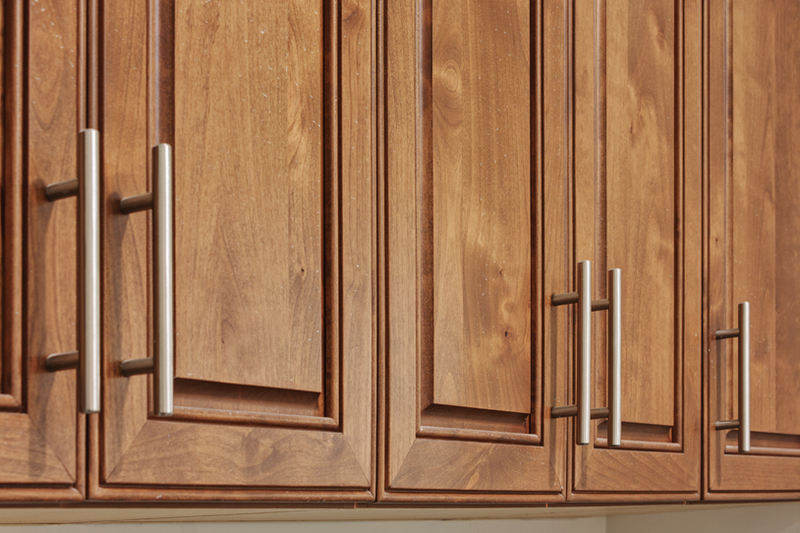 The custom wood cabinetry will make your employees feel like they’re right at home. 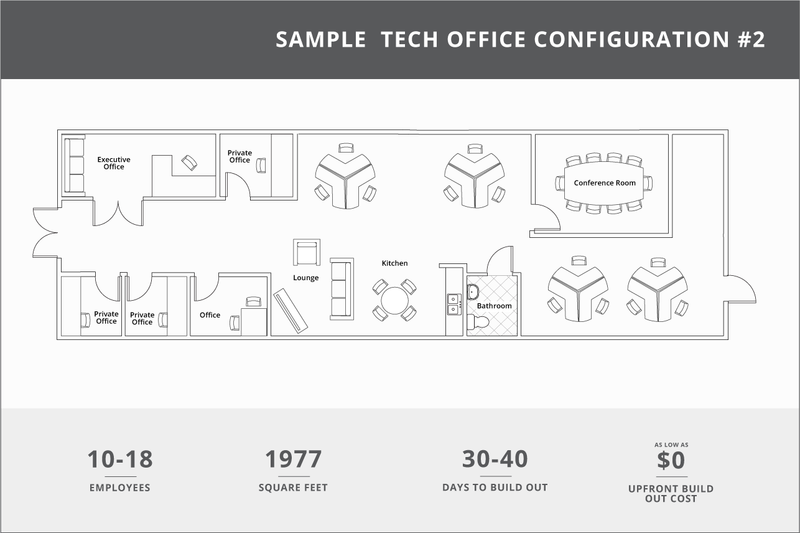 Choose an office space that has the unbeatable amenities your employees and clients need. 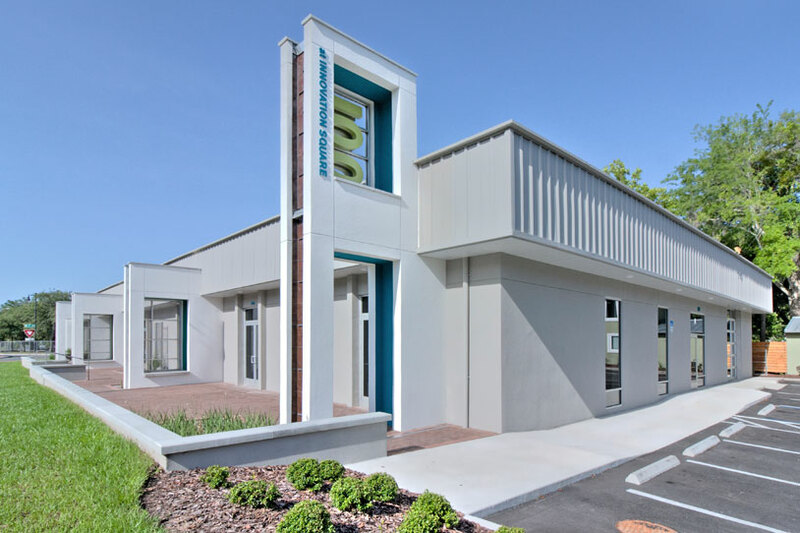 Happy employees are more productive employees - take your business to new heights with this Gainesville commercial real estate. Have some changed in mind? Make the space yours! Or let our award-winning design and contracting team do the hard work for you. We can make your space as efficient as possible, from the layout of the luxury kitchen to wall placement in the offices. Feel like you might need to expand soon? 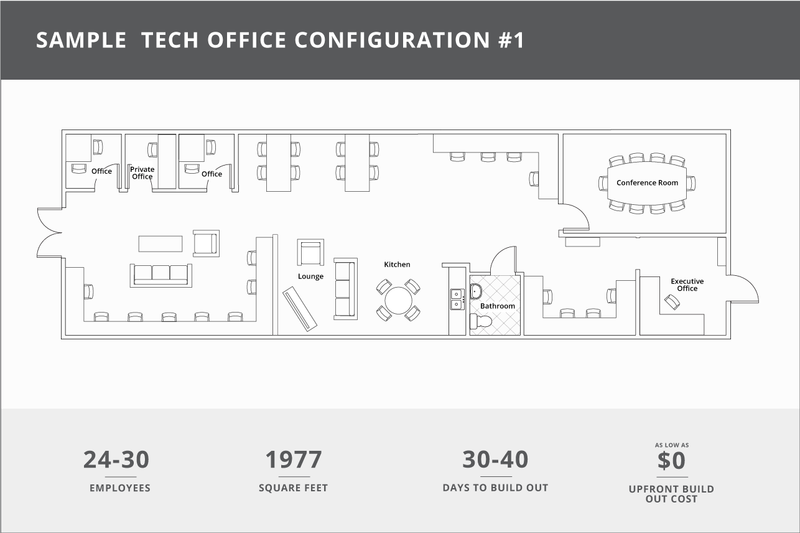 We can design your floorplan to easily accomodate a growing office without completing new renovations. We can help your business be as productive as possible, helping you to reach your full potential. 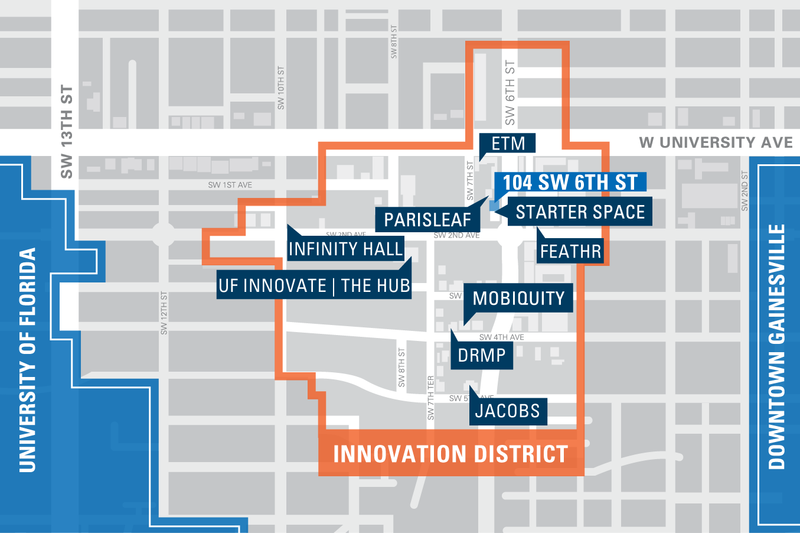 Move your growing business or start up to the middle of Gainesville's tech community, just steps from the UF Innovation Hub. 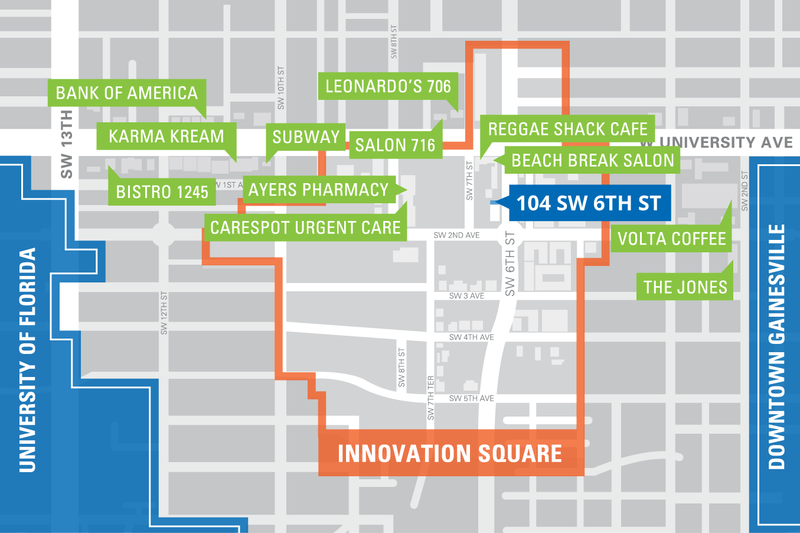 Innovation Square is a highly sought after location between the University of Florida and downtown Gainesville where businesses and tech companies can flourish. Take advantage of the wealth of student talent and knowledge surrounding your business. Worried about parking in downtown Gainesville? Don't sweat it. This Gainesville commercial real estate has two attached parking lots, ideal for both clients and employees. There's also a bus stop steps from the office and plenty of space for bike parking - perfect for those who live around the Innovation Square area. Surround yourself with other tech businesses and start ups that have already done the heavy lifting of establishing a growing professional network. The Innovation Square Business Network is a great location for companies looking to network and grow their businesses in Gainesville. Give your employees the work life balance they crave. Located just steps from University Avenue eateries and downtown Gainesville restaurants and nightlife, you'll never have to worry about your employees coming back late from lunch. Gyms, salons, and convenience stores are also all within walking distance of your new office. Increase productivity and morale in one move! The 104 building at Innovation Square is the perfect location for growing companies and successful businesses. Give yourself the competitve advantage of being located steps from a top educational institution like the University of Florida and learn from the best surrounding companies in the area. Let our award-winning design and contracting team do all the work for you (or do your own customization). 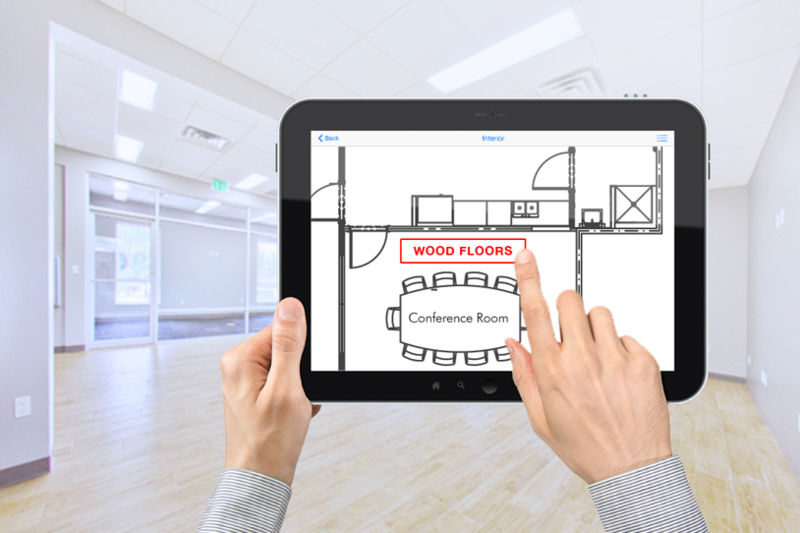 Our professional team will design a floorplan with custom offices, conference rooms, and storage areas designed around your business's unique needs - with no upfront design or construction expenses for you or your business! We can design a custom floorplan that will provide the most efficient use of the space - saving you money and increasing productivity. 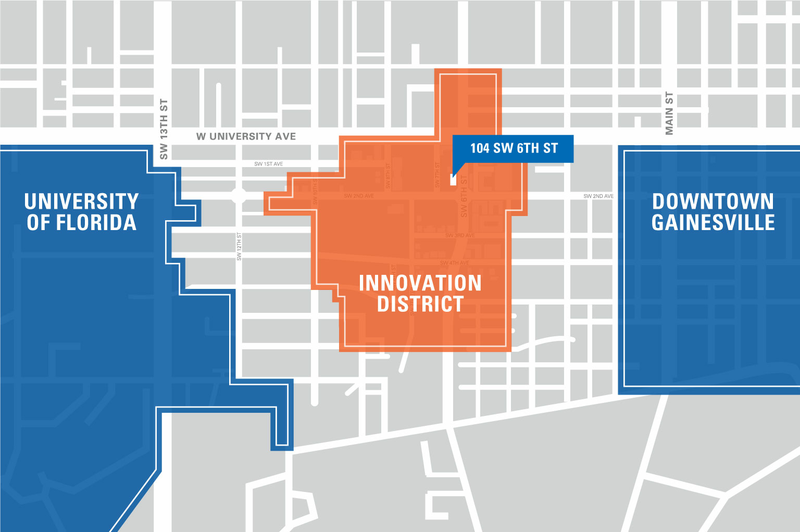 City, state, and federal incentives are available for select businesses that move into the Innovation Square area. Allow our business development team to analyze your eligibility and seek out any incentive packages that your company may qualify for. Contact us for details. Offers eligible companies a 50% match on eligible business relocation costs, up to a maximum award of $50,000. The program will reduce costs associated with physically relocating an eligible company into a Redevelopment Area. Incentivizes the creation and maintenance of high-wage jobs within the Gainesville CRA districts by offering a grant payment for companies that create or relocate a minimum of 5 full-time jobs within a Redevelopment Area. The grant is paid out over a 2-year period after the employees have been hired and/or relocated. Program provides training to currenly employed workers to keep Florida's workforce globally competitive. The program is available to all Florida businesses that have been in operation for at least one year. Priority is given to businesses in targeted industries, Enterprise Zones and HUB Zones. The CRA assists in the business growth and economic stimulation of specific redevelopment areas in Gainesville, FL. Through grant and high-wage incentive programs, it strives to attract companies that will create a lasting and positive impact on the Gainesville community. Available for companies that create high wage jobs in targeted high value-added industries. This incentive includes refunds on corporate income, sales, insurance premium and other taxes. Companies that create jobs in Florida can receive tax refunds of $3,000 per net new Florida full-time equivalent job created. Enterprise Florida aims to broaden and diversify the state's economy through stimulating job creation. To accomplish its mission, The Florida Enterprise Zone Program offers several tax incentives including tax refunds for business machinery and equipment and a sales tax exemption for electrical energy used in the enterprise zone. Not sure if this space is the right fit? We'll provide a custom conceptual floorplan with 72 hours, free of charge.